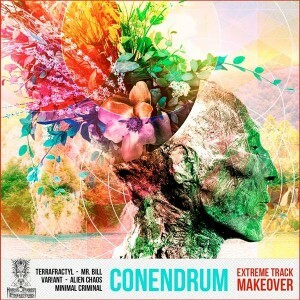 HorsePower Productions presents Extreme Track Makeover, a collection of six quirky remixes by Australian producer and percussionist Dave Kastner AKA Conendrum. With a strong background in jazz, funk, and metal, Conendrum uses his deep knowledge of groove and rhythm to create ever-changing sonic journeys across the psychedelic spectrum from deep mystical progressive to full-on mind-blasting psytrance. After making a splash with his debut Excream Cheese in 2012 this eclectic set of free-ranging remixes is a fitting exposition of Conendrum’s stylistic versatility. If you’re looking for something fresh with a lot of personality search no more! Artwork by Mackan Doodle with mastering by Anti-Logic, Berlin. MP3 Download | FLAC Download | WAV Download · Download count: 7,244.
some of these tunes are just a mess to my ears, in the first few tracks you can often hear a nice sounding psytrance bass obliterated in a whirlwind of DSP techniques every time the momentum begins to pick up, this for me is frustrating. There are too many incongruous elements haphazardly mashed together with no common sound space. the last track is pure magick, though, very nice manic forestpsy vibes with bouncy basslines. I like the Terrafractyl remix too. not sure why it’s tagged as progressive. ohooooooo the BEAT! gotta love these makeovers!!!!!! !